Featuring labyrintine streets and the Cathedral of Santa Eulalia, the Gothic Quarter is the center of the old city of Barcelona. Some buildings date back to medieval times and the remains of a Roman wall are visible. The Sagrada Familia, Barcelona's most idiosyncratic and flamboyant church, is regarded as architect Antoni Gaudi's masterpiece and has been under construction since 1882. 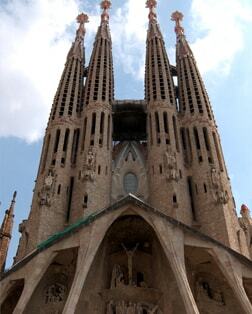 It features breath-taking spires and awe-inspiring stained glass windows. Barcelona's famed promenade is alive and colorful with flower stalls and cafés. Stroll the old medieval quarter of Barri Gothic. This wonderful monastery, considered Catalonia's most important religious retreat, is hidden high in the craggy Montserrat Mountains. The world's oldest publishing house, established in 1499, is also located here. Designed by Antoni Gaudi, Catalonia's master architect, this glorious park features many works of wonder, including a serpentine-shaped bench, stunning views of the city and a mosaic dragon at the park's entrance. Known locally as Casa Mila, Gaudi's most accomplished, finished work features an ornate façade with undulating walls and iron art nouveau balconies. The Picasso Museum houses one of the most extensive collections of artworks by 20th-century Spanish artist Pablo Picasso. One of the most popular attractions in Barcelona, it consists of five adjoining medieval palaces.